Our Funkee Monkee blend is a hit for those who love a little depth for the palate. And what goes better with English toffee, Mexican liqueur, and whiskey in your coffee cup than the delicious crunch of this Toffee Almond Crunch cake from FoodAndWine.com? Next, simmer 1 inch of water in a saucepan. Incorporate the bittersweet and unsweetened chocolate in a heatproof bowl and set the bowl over the simmering water to liquify the chocolate. Beat the butter and salt in a medium bowl at medium speed until smooth. Add in your rum, vanilla, and melted chocolate until fully blended. Mix in the confectioners’ sugar one-third at a time, and then stir in sour cream until fully mixed. Refrigerate frosting until you’re ready to use. Fan out almonds on a baking sheet, and bake for 8 minutes. Then let them cool in a bowl. Filet your now frozen cake in half and place on a separate plate. Spread one-third of your frosting on the cake and then top with the other half. Refrigerate for 30 minutes. Spread the remaining frosting evenly over the top and sides of the cake. Replace in fridge for one additional hour. 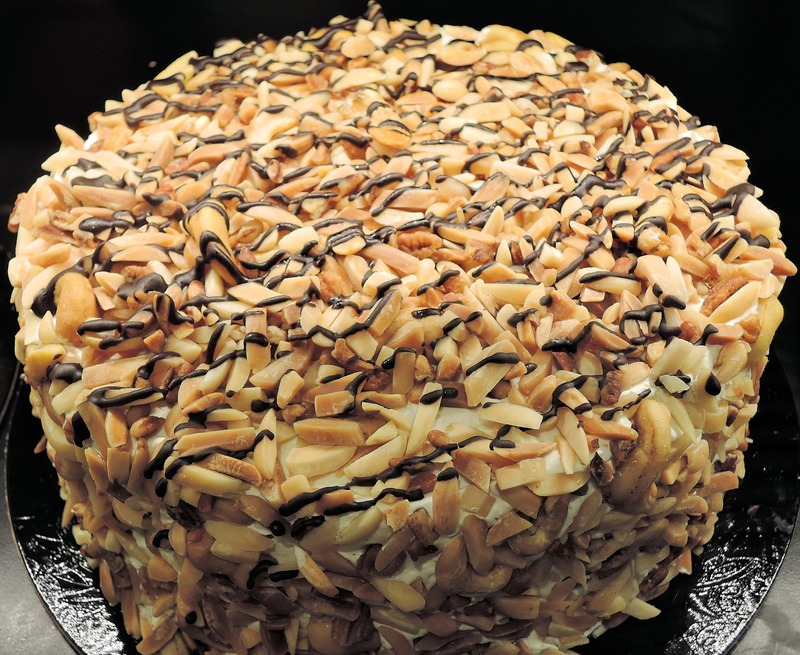 Now chop your cooled almonds and gently press into the top and sides of the cake. Last step: slice and serve! We want to see YOUR creations! Take a picture of your masterpiece and share it on our Facebook page, or post below!